"Mr. Kidd, please tell me this is not the church we seek." Stories like Frankenstein (or The Modern Prometheus for the English majors out there) are pretty rare. Somehow, they pretty beautifully blend terror with story, offering a tale that feels scary at times, yet is also written in a way that's quite beautiful. Many of the works in the Mignola universe do this as well and Baltimore: The Cult of the Red King #1 from Dark Horse Comics is no exception. The issue is written by Mike Mignola and Christopher Golden, illustrated by Peter Bergting and colored by Dave Stewart. Baltimore: The Cult of the Red King #1 has a very distinct explorer's feel to it, as there are essentially two groups rummaging through different areas of antiquity. 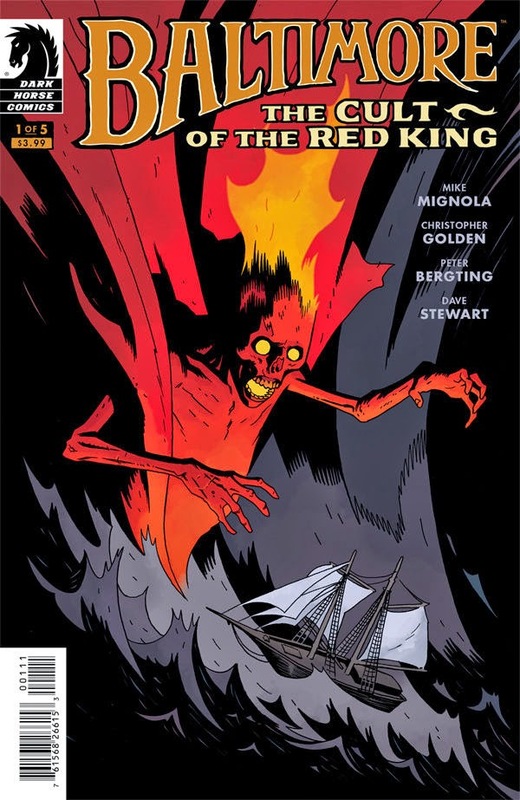 Mignola and Golden use both groups effectively to flesh out different aspects of the legend of the Red King. There's also a decent amount of backstory on Lord Baltimore himself, affording new readers the opportunity to better understand what makes the man tick. In switching between the two teams and touching on Lord Baltimore's past a bit, Mignola and Golden rather effortlessly craft a tale that's replete with intrigue and mystery. It's clear that all players are moving toward a similar goal, yet the exact identity of that goal isn't revealed in the first issue--there's room for even more intrigue. With the word "cult" in the title, you can expect things to be a little dreary in terms of the look and Bergting certainly doesn't disappoint. Bergting blends characters defined by striking appearances with environments that transport the reader to a different era of exploring. Each character is illustrated with a weightniness to them that further underscores the seemingly dramatic nature of their missions. And the locales are rendered quite eerily, ensuring the reader becomes engulfed by the macabre tone pitched by the plot. Stewart uses colors to tremendous effect throughout, offering shades of red and blue for emphasis in terms of time of day, mood and just general chills. Baltimore: The Cult of the Red King #1 is a great first issue. It hits a lot of right notes in terms of crafting a story full of tense excitement and uneasiness. Mignola and Golden are more than familiar with the style and players involved, leveraging their intimate knowledge into a story that feels like a story by a Romantic poet. Bergting's illustrations are strong and terrifying at points, largely due to a style that's simple. Baltimore: The Cult of the Red King #1 will appeal to fans of the series, as well as those looking for a comic book that's more "book" than "comic." Baltimore: The Cult of the Red King #1 is in stores May 6.